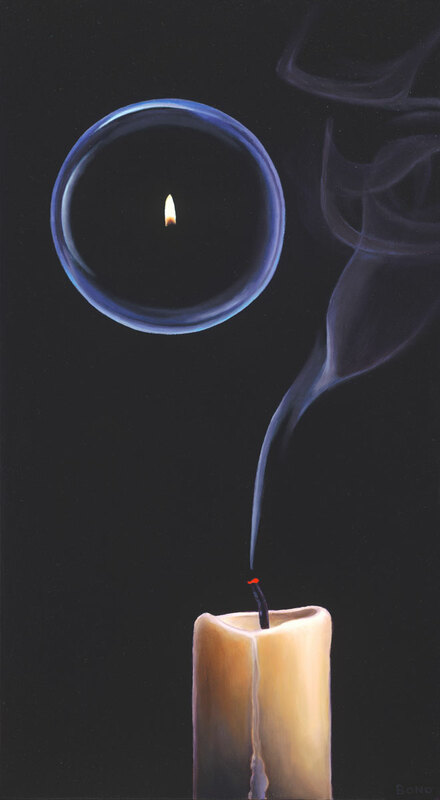 The extinguished candle here represents our physical bodies. In this case, one whose time on earth is complete. And the bubble of light symbolizes the eternal spirit. Our consciousness outside of physical form. It is my beliefthat there is unbroken continuity of awareness when we choose to transition from the physical to the nonphysical plane. Having experienced myself outside of my physical body, I know that death is not the end. I imagine that welikely emerge back into non physical existence as if we have awakened from a vivid dream. And with broader awareness and wisdom in why we made the life journey and choices that we did. The feeling of separation between us and those who have left is sorrowful indeed. But I have no doubt that it is all illusion. That they have simply slipped away into the next room. Close enough to feel their presence when we desire. All is well.